to consume and live by our debts. Maybe you've noticed the picture of Noam Chomsky accompanying a quote from an unidentified source that has been making the rounds on Facebook and a number of websites. I've tried to find where the quote came from, and the best I can tell is that it was from an article in the Ottawa Citizen that no longer has a working link from back in 2011. I've also found links back to the Chomsky Quotes Tumblr, but was unable to find the exact source there either. 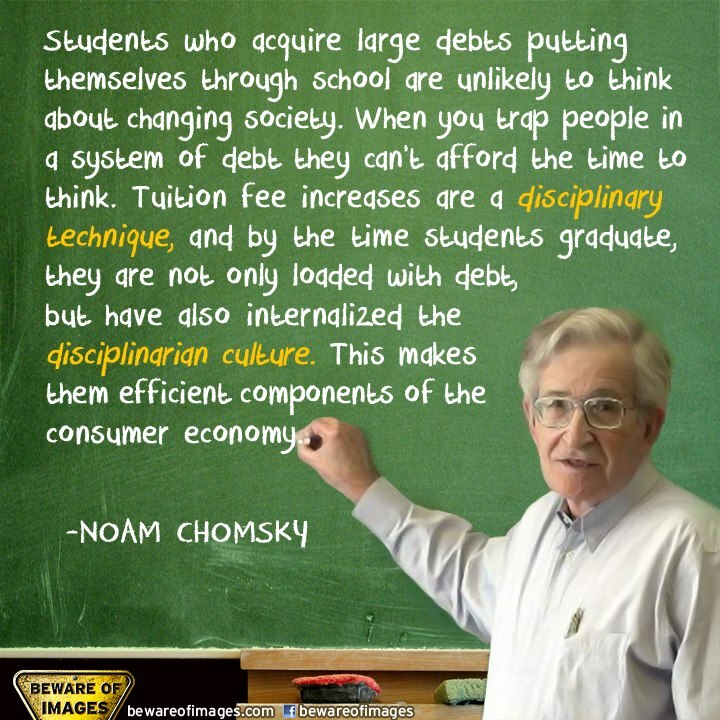 Regardless of exactly where the quote came from, or even if Chomsky said or wrote it, the message is still compelling, and fits well with the emerging movement to alleviate student debt on a national level. Students who acquire large debts putting themselves through school are unlikely to think about changing society. When you trap people ina system of debt they can't afford the time to think. Tuition Fee increases are a disciplinary technique, and by the time students graduate, they are not only loaded with debt, but have also internalized the disciplinarian culture. This makes them efficient components of the consumer economy. In my mind, the quote is a little all over the place, and could probably use some context (hence my curiosity about where it came from). Still, I think it captures the attention for linking debt, discipline, and mindless consumerism. Again, being unsure about the context of the quote, I hesitate to offer much critique, other than to criticize those who continue to share it without including a source. At least the quote is attributed, but without the source, it retains little of its original value. What remains worth some further comment are those three primary concepts: debt, discipline, and consumerism. I've already come out in support of the Strike Debt campaign (which is buying up student debt and not collecting on it, essentially "eating" the debt), and the need to rethink the entire student debt problem. I realize that many do not share my position, that education is a human right that should be free. At the very least, I believe that student loans should be interest-free - I don't believe that banks (or anyone else for that matter) should be able to make a profit when someone chooses to further their education. To illustrate how out of hand the entire student-loan debacle has become, I will share some details provided by a close friend, who shared a recent letter she received from Sallie Mae, the bank through which she had consolidated her student loans. Her original loan at the time of consolidation was about $22,000 US. While enrolled continuously as a full-time student in graduate school, the loan accrued interest, and is now nearly $28,000 US. Sallie Mae sent her a letter informing that payments on the loan would be expected starting later this year (during which time she will still be working on her dissertation, but no longer a full-time "student"). They only require a payment of about $200 US per month, however, they more than double their money over the life of the loan (the estimated interest on the loan is over $20,000 US, and the final total amount to be repaid is over $48,000 US). In my mind, and the mind's of many others, it's very difficult to justify such profit on eduction, especially when the bank played no role in the actual education. So in short, yes, there is a student loan problem (student debt reached $1 trillion US recently), and yes, such debt severely hampers a student's freedom. Mired in debt that they have been led to believe they must repay before they even have a job, does not allow students much flexibility as far as what they want to do with themselves. The answer for students appears all too clear: work. Get a job. Any job. And we all know that in the new service economy, jobs aren't quite paying what they used to. But the bigger point, and bringing it back to the Chomsky quote, is that herein lies the discipline part of things. Students are disciplined to fall in line with the system. They are taught (disciplined to believe) that they have no other choice. The very purpose of the educational system - any educational system - is discipline. Through education, children are taught the correct way to act and behave to best succeed in a given social environment. Education is a form of discipline. French social theorist Michel Foucault most famously explained discipline as a means to create "docile" bodies (people) that can be ordered, trained, observed, and controlled. Discipline works, because if we fall out of line, we are subject to punishment - in the form of fines, physical abuse, and imprisonment. For most, simply the threat of punishment is enough for them to accept their discipline. In the end, we have all been disciplined by our education, no matter how much of it we may have achieved - or should it be received? So where then, do student debt and discipline connect back to consumerism? In actuality, this connection is what links all the concepts together. In the contemporary US, the model citizen is the consuming citizen. To best fulfill your obligations as a citizen, you must partake in the consumer economy, even if that means going into debt. In fact, debt is an accepted and expected part of life. In simple terms, we are disciplined to consume our way into debt, followed with the threat of punishment if we do not honor that debt. Student debt has emerged as the latest trend in bringing younger and younger people into that system of debt peonage. Today, students are disciplined into the debt system before they've ever made it to the work force. Why does any of this matter, you might ask. As Chomsky notes, a student burdened by debt is probably less likely to devote time to activism and change. The burden of debt is actually the burden of punishment. Nobody wants to go to jail. For most, the discipline of debt can not be escaped. Banks like Salie Mae can legally garnish your wages - that is, if you earn a paycheck, they can legally take part of it. How else to survive today, except through work and earning a paycheck? And yet our debts, including our student debts keep us in a state of struggle. It's also critical to remember that our struggles serve to make others wealthy. By "allowing" us to borrow money for education, the rich (the banks and bankers) continue to get richer, and the poor remained disciplined by their debts. Our students are not in debt to their educational institutions, the teachers, their parents, or their neighbors, but to the banks. And that's why all of this is important - by holding us in debt, the banks are effectively undermining the power of education, and at the same time, controlling the masses. Labels: activism, consumerism, economics, education, U.S. Interesting connections, although I would be interested in more on the education as discipline line that you take. Thanks for the thought provoking read. The point you make about profiting off of debt is an excellent one that people who critique loan forgiveness programs don't take into account. They say, if you weren't lucky enough to have someone to pay for your college and you chose to take out the loans then you should pay it back. I would gladly pay it back. Just don't burden me with the interest needed to turn a profit. I agree with Tender B, and I don't often hear the interest/profit part of the argument. I have to confess, though, that I'm still annoyed to hear stories from graduates who went to outrageously expensive private schools complain about not being able to find a job (despite their expensive education) and now can't pay back their loans. I'm not an anti-intellectual (obviously, as I'm reading this website), but it seems a lot of people still have blinders on about what the cost of education should be in the first place. Or that education is something that is done to you (and hence worth paying $100,000 for), rather than what you put into it (and maybe only pay $10,000). On a side note, wasn't our school model based on Henry Ford's industrial production lines? The government is also making billions on student loans. From the New York Times: "the federal government makes 36 cents in profit on every student-loan dollar it puts out, and estimates that over all, student loans will bring in $34 billion next year." This makes Obama's urging everyone to go get a university education a bit suspicious, no? The non-dischargeable status of the student debt makes it more difficult to get rid of. Evidently, this status has been assigned to the student debts since it’s assumed that educated individuals have increased scope of being successful, and success brings about financial stability. Well, statistics prove the assumption is nothing else, but an assumption only. Student debt is the most prominent form of household debt under which the US citizens are staggering, the largest among unsecured debts, and only second to the mortgage debts. It’s kind of evident, that a student with debt burden on his shoulder would be less open to bring about change. He’ll be more inclined to focus only on financial growth so that he can save his back as soon as possible. The real development of the society-at-large takes a setback.